The most confusing aspect of The Mysteries Of Laura is whether or not the show is self-aware enough to realize it’s generic to the point of absurdity. Debra Messing is Laura Diamond, a tough-as-nails cop who’s great at her job, but not great with her messy personal life. Her twin sons are a collective nightmare and her estranged husband (Josh Lucas) is an incorrigible man-child. Laura enjoys cheesecake, strong drinks, betting on sports, and busting criminals, which communicates that she’s still cool. Then, just to make sure the viewer understands that Laura Diamond is not to be trifled with, she takes care to leave every scene with a quip, or at least the semblance of one. 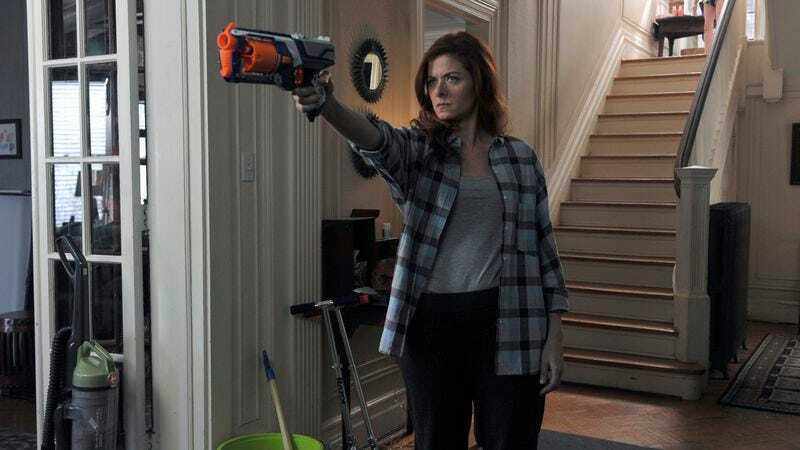 There are also several moments when Mysteries Of Laura pushes its heroine into a prickliness and moral ambiguity that House thrived on, but the message is confused. Laura blackmailing a teacher to get her kids into school is less than model behavior, but well motivated within the context of the pilot. On the other hand, Laura force-feeding her children cough syrup to sedate them for an interview is less understandable. The show wants to convey Laura’s commitment to getting things done, but her methods mark an alarming blindness, not determination. This faux-coolness is the problem with much of the show’s pilot. It’s rarely clever, but there’s a pervading sense throughout that The Mysteries Of Laura thinks it’s very clever. Laura’s would-be zingers force viewers to find her funny. There’s the moment when Laura gets an emergency call, rushes off to the scene of the crime, and delivers a seething speech about how depraved it is—only to have the camera pan around and reveal that she’s busting her own children. Even if it wasn’t featured in previews for the show, this “reveal” wouldn’t be a surprise. But the episode’s unconvincing case of the week would barely register if it weren’t for the fact that its every reveal is just as thin. If we’re meant to believe that Laura Diamond is the smartest cop no one pays attention to, the crimes should challenge her by being just as smart. As for the “personal life” side of the equation, Laura’s rambunctious kids are nothing compared to her husband, Jake. Beginning their story at the point when Laura’s just trying to get Jake to sign the divorce papers means we don’t get to see their relationship when it was good, and so his aggressive thoughtlessness after the fact hardly endears him to the audience. Sure, Jake cheated, but he claims it’s “out of my system now,” so why can’t Laura just get past it? It’s clear that Jake is supposed to read as a flawed but affectionate partner—and it’s just as clear that his smarm trips him up. But for someone who’s trying to keep his marriage together, Jake is awfully cavalier about being terrible to his wife. He rubs his higher work status in her face. He shrugs off Laura’s concern throughout the pilot with grins and forced kisses from which she physically recoils. Nothing about Jake’s aggressive negligence toward their kids or Laura herself is appealing. “Rough around the edges” is one thing—willfully careless is quite another.